My grandmother Grace Elizabeth Molby White’s family settled in South Marquette, and they were among Marquette’s earliest residents. My great-great grandparents John and Elizabeth Buschell were married in Marquette in 1858. Neither John nor Elizabeth are listed on the first Marquette census of 1850 and no relatives appear to have been in Marquette with them. John was born in 1820 in Saxony, then one of the many little kingdoms and principalities that made up greater Germany, while Elizabeth was born in Massachusetts of Irish parents. No information has been found about their parents or families. John and Elizabeth were to become my inspiration for Fritz and Molly Bergmann in Iron Pioneers. Since John was clearly German, I decided to make Fritz part of the group of German immigrants who arrived in Marquette that first year of 1849 and be among those who came down with typhoid and for whom, Peter White, perhaps Marquette’s most famous pioneer, cared, bathing them in the makeshift hospital. These Germans later started to walk to Milwaukee in December to prevent the rest of the village from having to starve until word was sent after them that the supply ship had finally arrived. In the novel, Fritz is frequently ill, never having quite recovered from the typhoid. Since I know so little about John Buschell, I used my imagination to fill in the holes. I can find no death record for John. I only know he and Elizabeth had their last child, Thomas Buschell, in 1876 and then on the 1880 census, Elizabeth is remarried to a Jeremiah O’Leary. Perhaps John’s death was not reported and I can find no listing for him in a cemetery. In any case, I assume since Elizabeth remarried and since divorce was not common in those days, especially among Catholics, that John died, and since Fritz therefore would also die young, the typhoid and a lingering weakness as a result was a good way to explain his untimely death. When I first became interested in genealogy and tried to find information about my Grandma Grace Molby White’s family, I heard stories that we were supposedly related to Mrs. O’Leary, whose cow started the great Chicago Fire. I assume this story comes from Elizabeth’s second husband being an O’Leary. I have not been able to locate much information about Jeremiah O’Leary other than that he was Irish and came to Marquette through Canada—his naturalization and immigration records exist in the Marquette County records. I have not been able to locate any relatives for him, but in Elizabeth’s obituary, it does state that she lived in Chicago for some time, so it is possible that Jeremiah had relatives in Chicago whom they went to visit, but for now a blood connection has not been confirmed between Jeremiah or the Mrs.O’Leary who had the infamous cow. In Iron Pioneers, I also had Molly remarry, but I deviated from the family history, feeling I had already attested to the presence of Irish immigrants in Marquette, so I married her instead to an Italian, the brutish saloonkeeper, Joseph Montoni. I felt I wanted the novels to represent the wide number of immigrants who came to Upper Michigan, and the Italian population was significant, although that Montoni beats his wife and dies in a saloon brawl would not make his nation proud. John and Elizabeth Buschell had several children, two of whom particularly have lived on in family stories, notably their son Frank and their daughter Lily, the inspiration for Karl and Kathy Bergmann in Iron Pioneers. Frank Buschell, like Karl, was a logger and he did end up in the Keweenaw Peninsula. Rather than marrying a Finnish wife who died in childbirth, the real Frank Buschell’s wife, Mary, gave birth to several children, most notably for my fiction, Valma Buschell, the inspiration for Thelma Bergmann. Valma was my grandmother’s cousin and like Thelma, she came to live in Marquette. She was a wonderful pianist but she also suffered from epilepsy, which I changed in the novel to multiple sclerosis. I am sure she was much brighter than I depict Thelma as being, but one other aspect of her story is true. As far as I knew, she never married, but one day while looking through the Marquette County marriage records, I stumbled upon a listing for her in the marriage index. Surprised, I went to find the actual marriage record, only to find there was none. The clerk at the courthouse explained to me that the license must have been applied for, but that the couple had never married and therefore, had not returned the document. What happened to Valma’s prospective marriage, I don’t know, but she never did marry. In writing fiction, however, I could always make up stories to fill in the blanks as I did here, having Thelma Bergmann elope with Vincent Smiley to Mackinac Island, only to find out he was a bigamist and her marriage not legal. Valma never adopted children, but I decided in The Queen City that Thelma would adopt Jessie Hopewell. I was inspired by this plot twist after visiting the historical Honolulu House in Marshall, Michigan. In the house was a photo of a girl who had been adopted by the female owner of the house—only the owners had been white, and the girl was black. Interracial adoptions in the early nineteenth century must not have been common, so again, I thought it would make a great story. Only, Marshall, Michigan was more likely to have black residents—it being near the route of the Underground Railroad that aided escaped slaves. Upper Michigan has very few black residents, and I had given little treatment to the large Finnish population in Upper Michigan, so I decided to make the adopted child Finnish and her adoption explainable since Thelma was herself half-Finnish although her mother had died before she really knew her. It also allowed me, in the person of Jesse’s father, to tell the fascinating true story of how many American Finns had left during the Great Depression to go to Karelia, in Russia. One last interesting piece about the Buschell Family is that Buschell Lake, just south of Marquette, is named for them. No one seems to know exactly how the lake came to be named for the family—I would assume it was named for John or for Frank and that one of them owned property on it although I have been unable to find property record to confirm this. As for Frank’s sister, Lily Buschell, she married John Molby, who came to Marquette in 1882. John and Lily would be my grandmother’s parents. Like her counterpart, Kathy, in the novel, Lily would end up going near deaf from the measles. I don’t know when this happened, but I decided to place it during World War I for dramatic purposes. Also, as in the novel, my great-grandparents’ sons went off to fight in World War I. My grandmother, Grace Molby White, said she remembered as a child going down to the train station to see her brothers leave for the war. Both Daniel and William would fight in the war, William going to Camp Custer in September 1917 for training and Daniel to Camp Gordon, Georgia in June 1918. After my grandmother died, we found among her belongings a handkerchief that had “Paris 1918” stitched on it which she had preserved—doubtless the gift of one of her brothers. She would have only been thirteen the year the war ended, although I chose to make her counterpart, Beth McCarey, five years younger so she would be all the more confused in trying to make sense out of the war. My grandmother said very little about her family whenever anyone asked her questions. She told me her father was from New York, but other records say he was from Canada, and one family story said the Molby family left Ireland because they were rebels. I have found no direct connection to Ireland, but because Great-Grandpa Molby’s past was such a mystery—after nearly twenty years of searching, I still haven’t found out where he was born or who his parents were—I decided to make up information and depict Patrick McCarey as a rebel who did have to flee Ireland. This decision also allowed for the dramatic scenes in The Queen City when he is old and senile, and while hallucinating, he runs from the house, believing British soldiers are after him. John Molby was himself a bit senile and ended up running down the street in his nightclothes at the end of his life, and my grandparents would have to chase after him to bring him home when he was living with them, although what he was thinking during this time remains a mystery. I also made Patrick an atheist in the novel because John Molby apparently did not go to church or at least was not Catholic, while his wife attended St. Peter’s Cathedral and made sure all the children were baptized there. John Molby’s funeral was held at the First Presbyterian Church, although he was not a member there, and he was buried in the Protestant Park Cemetery while his wife and several children are buried in the Catholic Holy Cross Cemetery. According to my other family members, the older Molby generations never talked about the family. Part of the reason I’m sure is because of the tragedies they experienced. My grandmother was one of ten children, yet none of her eight brothers lived beyond their early fifties. My mother never knew any of her Molby uncles as a result and my grandmother almost never talked about them. Only after we found her brother’s obituaries among my grandmother’s belongings after she died did we know my grandmother’s brother Charles was accidentally electrocuted at his job in his early twenties, leaving behind a wife and daughter with whom the rest of the family lost contact. Other brothers died of heart attacks, or what today sounds like an aneurism, and one brother died of alcoholism. I imagine all these early deaths were painful for my grandmother, who by age thirty-six, only had her sister Mary still alive, and Mary would die in 1958 at only sixty-two of cancer. My grandmother was convinced she would die young like the rest of her family, but surprisingly, she lived until 1992, passing away at the ripe old age of eighty-seven. In writing The Marquette Trilogy, I found it necessary to reduce Beth McCarey’s siblings down to three brothers—eight brothers and a sister would have been too many for a reader. I had one brother die in World War I, one die in the Barnes-Hecker mining disaster for its historical significance, and the third brother, Michael, become a priest. None of my grandmother’s brothers became priests, but I had my reasons for Michael to become a priest in the novels as I’ll explain later when I discuss St. Michael’s Parish. My Great-Grandparents Molby’s home on Division St. still stands today. 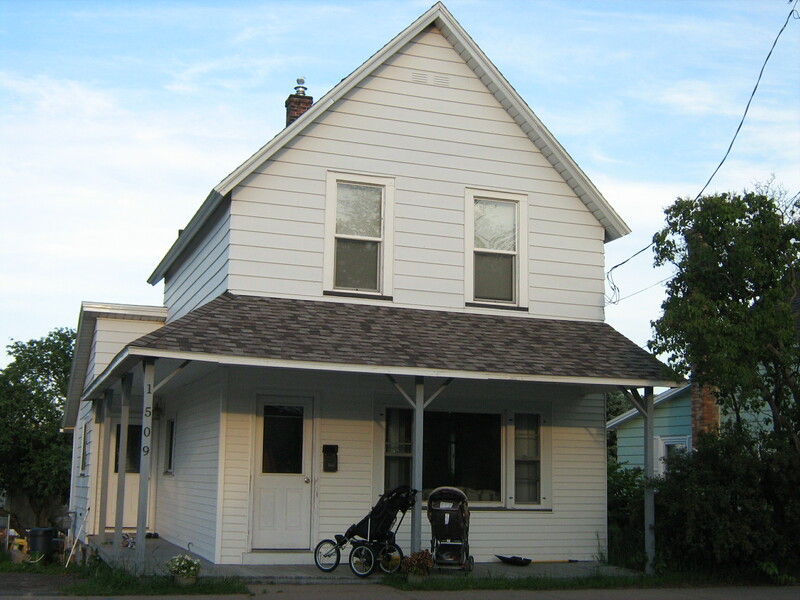 My Great-Grandpa and Grandma Molby lived at 609 Division Street in Marquette—their house is still standing today although it was sold out of the family in the 1930s when John, then a widower, went to live with his adult children. In the novels, I had the Bergmann and McCarey families live within only a block or so of St. Peter’s Cathedral because of the importance of Catholicism in their lives, and especially, partially to explain how the nearby cathedral’s influence would have inspired Michael’s desire to become a priest—along with the influence of his saintly grandmother, Molly, whose obituary as given in The Queen City closely resembles that of her real-life basis, Elizabeth Buschell O’Leary. Today, the Molby name still exists in Marquette in the descendants of my grandmother’s brothers. The Buschell name is not found in Marquette, but Frank Buschell’s descendants populate the Keweenaw Peninsula, carrying on his name. Note, I am always happy to hear from long lost relatives. I would love photos of any of the Molbys or Buschells or any other information people might be able to provide about the families.